First Annual Uptown Westerville Beg Hunt! Anyone ever been to the Beg Hunt in Columbus’ Short North? If so, you’ll be familiar with what will be happening in Uptown Westerville on Saturday, April 12! 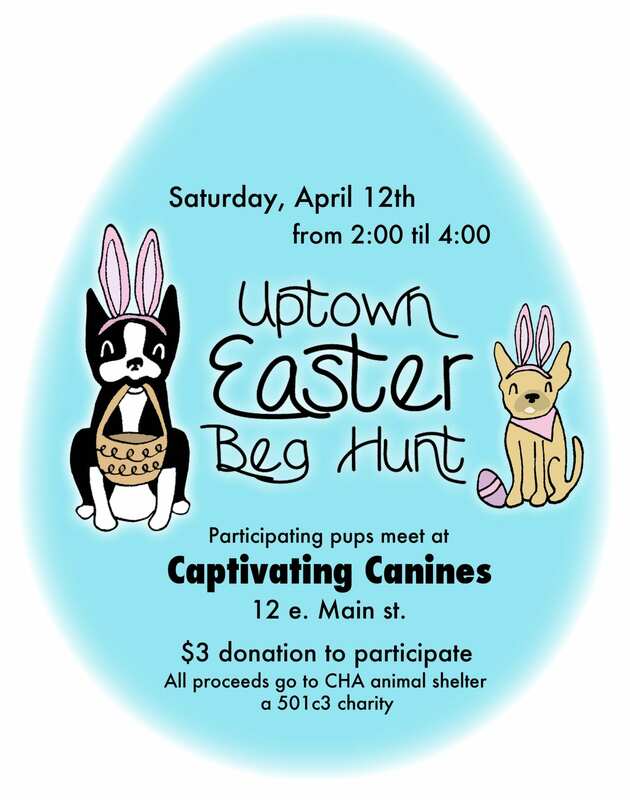 Grab your four-legged friends and bring them to participating shops in Uptown for a canine Easter egg hunt. The event is officially being sponsored by Captivating Canines; everyone interested in taking part will need to check-in at the store between 2-4pm on the 12th. A $3 registration fee—which will be donated to the CHA Animal Shelter will get you a bag for your pups’ goodies and a map of the participating vendors. At each Uptown shop, your pup will get an egg with a treat. Some of the eggs will have special prizes; others will just have yummy goodies for the dogs! 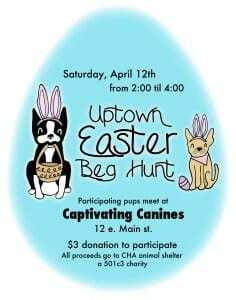 We’re hoping the Beg Hunt will be a great opportunity for all of our dog loving customers to enjoy a leisurely stroll through Uptown— on what we hope will be a far more seasonally appropriate spring day! No pre-registration required. Captivating Canines is located at 12 East Main, just off of State Street. Hope to see you from 2-4pm on April 12th!